“A military spokesman said: ‘The Army can confirm there were a number of helicopters in the vicinity. If the pilots did fly too low, we are sorry, but it can be difficult to spot parked cars in the dark. If a formal complaint is made to the Ministry of Defence, it will be investigated fully. “More amazing information today, Linda. Someone saw my write up the the paper and contacted me. I went to see them. The couple concerned live in Bottlesford which is situated 1 mile approx south of East Field (near Woodborough Hill). They are a couple in their mid-60’s called Mr and Mrs Hyde. They were in their home on the 26th August (the same night as mine and Tom’s incident) when they heard a helicopter approaching. To their horror. it hovered just 3 feet away from their chimney stack. Mr Hyde ran out to shout at them. The helicopter was black with guns either side. It rocked forwards and backwards in the same spot for a few minutes. It totally horrified Mr Hyde. The whole house shuddered and Mrs Hyde was too frightened to go outside. It was 6.30 in the evening just a few hours before our incident. When it left, Mr Hyde went into the house and phoned the Southern Command headquarters. It was discovered that the pilot was called Mr Rory Burnett and he lives local working as an instructor for the military. Mr Hyde was given an apology which he didn’t accept as this had happened to him before. He is still furious. The awful thing is that they have noticed that since the incident they can see big cracks appearing all over the house after the intence shuddering caused by the helicopter. I am going to see them again tomorrow and I will videotape the house cracks and interview the couple. If you would like me to send that also on video I will do so next week. September 3, 2003 East Kennett, Wiltshire, England – Over the years, I and others who have visited the Vale of Pewsey in Wiltshire, England, to explore crop formations have encountered helicopters maneuvering directly over crop formations – or over some of us on foot or in our cars. Once such incident occurred on July 25, 1996, when Kerry Blower of East Kennett had gone up Knap Hill to videotape the eerie “DNA Molecule” pattern first discovered in the East Field on June 17, 1996. A week later on June 25th, Kerry watched several helicopters over the East Field near the road leading from Lockeridge to Alton Barnes. That is the same area in which Colin Andrews had his own close encounter with a helicopter in 1994. Kerry reported that at least three helicopters were hovering low over East Field, apparently photographing the crop formation. She ran her camera on them until the aircraft suddenly flew directly toward her in a dangerously low and intimidating maneuver. She was very scared and got back to her car, but kept the camera running wrapped inside her coat. Below is one frame from the videotape that Kerry’s camera recorded. 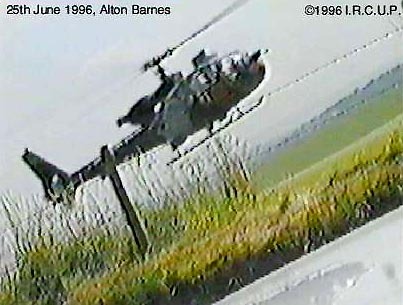 Unidentified helicopter rises from East Field over the barbed wire fence along the road and hovered low over Kerry Blower’s car. Video frame isolated from Kerry Blower’s June 25, 1996, camcorder tape by Paul Vigay, cropcircleresearch.com. Knap Hill rises at the northern end of the huge East Field, the focus of both crop formations and military helicopters. Kerry Blower, Musician and Singer, East Kennett near Marlborough, Wiltshire, England: “It was Tuesday, August 26, at 21:30 in the evening ( 9:30 p.m.). Tom and I went to Knap Hill with my camcorder to try and film Mars. We thought we would get a real clear view from that vantage point. While we were there, we noticed a helicopter blowing the field in front of us in the East Field. It was hugging the contours of the field and moving very slowly in front of us around the field. Then it flew off to our right about 300 feet in front of us the first time. Then the second time, it started doing the same maneuver again in front of us when suddenly it turns toward us and just flew straight toward us. I couldn’t believe he was heading straight toward us at the same height as the car. I was so mad and angry and furious that our military can do this to people on a public place, you know? We drove around the area for awhile that night. I was so traumatized. As soon as I got home that evening around 11 o’clock, I decided to phone the military. They gave me seven different telephone numbers of different people passing the buck from one person to another until in the end, someone eventually said, ‘Right, OK. I’m logging this as an official complaint. And we will take it further. We will find out exactly where they came from.’ And he said that if he hadn’t heard from ‘them’ (identity unknown) in a week, I should contact this guy back. He was from the Seventh Regiment in Netheravon in Wiltshire. And he said he will sort this out personally. In the meantime, I took it to the local paper (Gazette & Herald) and luckily enough a journalist there said he knows so many people now in Wiltshire who have been buzzed by these helicopters that he himself would call White Hall (government offices in London) to find out further and demand to know what is going on in all the harassments of people in this area. He has taken the story from me and it’s going in the paper tomorrow, so I would like to collect everybody else’s experiences and really find out what is going on in the East Field and others. SO FAR YOU HAVEN’T HEARD ANY WORD FROM WHITE HALL OR NETHERAVON? Not a thing. Strangely enough, the same incident happened in 1996 in the daytime. I also filmed that incident as well. I got them in broad daylight harassing me in the same area. COULD YOU GO BACK OVER WHAT HAPPENED IN 1996? In 1996, there was a crop circle in the field down there (in the East Field) ­ it was the ‘DNA’ formation. And I decided to go there with my camcorder and sit on the hill opposite about 12 o’clock in the day. And as I was there, I noticed a military helicopter was flying over the circle, hovering there for a few minutes, and then flying off. It did this about three times in an hour period. On each time, I filmed them doing this. Then, I got bored with that and I thought I should leave. But this feeling of hell came over me, ‘Get off the hill! Get off the hill!’ I didn’t know what was wrong with me. But I got to my car and I heard this noise. I thought it was like a juggernaut coming down the hill or something like that. to my horror, a helicopter came up over the field right in front of me and the propeller blades were literally feet from my head. The belly of the helicopter was sunk toward East Field, so the propeller blades were coming up and over the public road. He didn’t know I was filming him because what I did was put the camcorder on the bonnet of the car and threw my coat over it. So, he didn’t know he was being filmed. I put my fingers in my ears because the noise was unbearable and then I grabbed my coat and the camcorder and it was still running and I got into the passenger seat. At this time then, he then came over the top of the car, almost touching the top of my car, and came with me all the way down the hill. I was absolutely traumatized by that experience. It gave me a fear of helicopters for two years. And now I thought I was over it and OK, and now it happens again. DO YOU THINK IT’S BECAUSE THERE COULD BE SOME KIND OF MYSTERIOUS ENERGY IN THE ENVIRONMENT THAT IS INVISIBLE TO YOUR AND MY EYES, BUT THAT IT WAS SOME HOW AROUND YOU AND TOM AND THAT IS WHAT THE BRITISH AND AMERICAN MILITARY ARE SCRAMBLING ­ WHATEVER THE SO-CALLED INVISIBLE OBJECTS ARE THAT ANDY BUCKLEY HAS SAID SOMEONE WORKING INSIDE THE M.O..D. HAS TOLD HIM THAT THEY DO TRACK AND DO GO AFTER OBJECTS THAT ARE INVISIBLE? 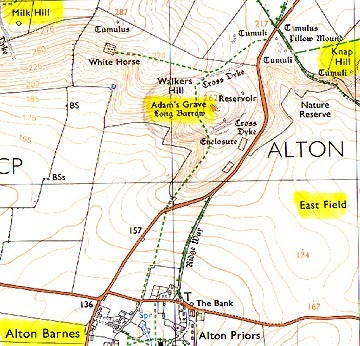 I’ve been very interested in that particular area (Knap Hill) for thirteen years and I know that there is something so strange going on there. I’ve seen so many videos by people who have filmed harassing helicopters, balls of light. I don’t know what on Earth is happening, but something is happening and they seem to want to get us away from there. It’s like they want to frighten us off ­ ‘Just go away, please. We’ve got things to do.’ Whatever it is. Because I’ve been harassed twice now. It’s a horrible thing to be harassed by a very loud helicopter and I’m angry as well now. It’s made me angry to think I can’t go and sit on my favorite hill without the fear of being harassed by our military who are supposed to be defending us. DO YOU OR TOM HAVE ANY IDEA WHAT KIND OF HELICOPTER IT WAS, COMPARED TO AN APACHE OR GAZELLE? Didn’t have a clue. It didn’t have any lights, no search lights, just red and a green flashing lights underneath. Other than that, you couldn’t see the helicopter at all. All you could see were the red and green lights. You could see it as it approached the car windscreen, but really what you could pick up on the video in the night time was just the noise and the downdraft on the grass and that is what you could pick up there. DID YOU AND TOM HAVE ANY SENSE OF HOW CLOSE THE HELICOPTER GOT TO YOU ON KNAP HILL THIS TIME? Tom said he could see the belly of the helicopter when he looked through the window and he estimates it could have been between 12 and 20 feet above the car. WHY WOULD THE MILITARY BE TAKING THESE AGGRESSIVE HELICOPTER ACTIONS AGAINST YOU, AGAINST ME, ANDY BUCKLEY OR ANYBODY ELSE? I think it just proves that there is something they don’t want us to see in that area, definitely. Otherwise, why would they do this? Initially, I thought they were doing it for a bit of fun. But there again, they wouldn’t harass all of us for a bit of fun. I reckon there is something they don’t want us to see. I don’t know what it is. Maybe the balls of light flying around. I don’t know. Maybe a secret military weapon flying out in this area and they don’t want anyone to see it under any circumstances. but there is definitely something and what they are doing in effect by trying to keep us away ­ they are attracting us more to the area! Because I want to go there more often now with my camcorder and I know I’m going to be frightened. So I’m going to take other people with me. I’m hoping to almost tease them to come back again because I want to know why they are doing it! It’s absolutely ridiculous to do this and very dangerous. YES, IT IS. FOR ANYBODY TO SAY THAT ANY OF THIS BEHAVIOR IS EXCUSABLE AS PREPARATIONS FOR THE BRITISH AND AMERICAN MILITARY FOR DUTY IN IRAQ DOES NOT JUSTIFY COMING DOWN OVER ME AT THE WOODBOROUGH CHURCH OR OVER YOU AND TOM AT KNAP HILL.